Catcher defense is one of the more enigmatic areas of baseball study. It has developed relatively independently of other position player defensive analysis. This is probably because, although catchers field some ground balls and pop ups, their main defensive contribution is very different from that of all other position players. This contribution is mostly in preventing stolen bases, passed balls and wild pitches. The difference in ability to do those things, as well as not make fielding and throwing errors, resulted in a range of 13 runs above average (Gerald Laird) to ten runs below(Mike Napoli) in 2009 by devil_fingers' calculation. This is about the same range of catcher performance that Brian Cartwright predicted before the 2009 season. About one extra win picked up best the best defensive catcher, and one run given up by the worst. These analyses are based on Tangotiger's WOWY method. He calculates each pitchers' rate of PBs and WPs and then predicts how many PBs and WPs a specific catcher should expect to have based on how many PAs he has with each pitcher. The difference between these predictions and the actual amount he gave up is a measure of his ability to prevent PBs and WPs. David Gassko takes a similar approach, but uses pitching staff numbers: strikeouts, earned runs and hits batsmen, which predict PBs and WPs quite well. Then finds the difference between expected, based on these numbers, and actual for each catcher. With the availability of the pitchf/x data we can take the same idea, but on a per pitch basis. By examining the pitchf/x characteristics of each pitch we can create a model which predicts how often the average catcher lets a pitch pass (as a PB or WP). From there we can predict the number of PBs and WPs that the average catcher gives up if he saw the pitches seen by a given catcher, and then how many more or fewer PBs and WPs that catcher gave up. One limitation here, which has been discussed before, is we do not know where the pitch was supposed to go. Maybe a catcher called the pitch on the outside and it was on the inside edge, a place most catchers do not give up a PB, but since he was expecting it elsewhere it gets by. In a pitch position based model the catcher would be penalized in such a scenario. In this post I will briefly summarize some findings concerning pitchf/x and PBs and WPs, and then present a full model and catcher evaluation in a future piece. The first thing we can look at is the difference between a passed ball and a wild pitch, which is obviously a subjective decision of the scorer. 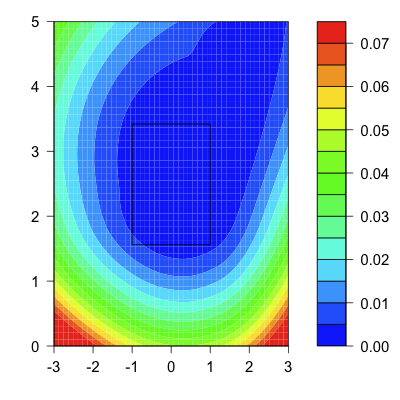 Here I plot the frequency distribution for the distance from the center of the plate for all pitches, passed balls and wild pitches. You can see that passed balls are a little farther from the center of the plate than the average pitch, but that wild pitches are drastically so. Thus scorer are calling pitches far out of the zone wild pitches while those that look more like a normal pitch a passed ball, but there is considerable overlap. Next we can look at the probably that a pitch gets by the catcher, if it is passed or wild, based on its location. I think this is going to depend on the handedness of the batter and pitcher so here I show the graph for RHB v RHP. The image is from the catcher's perspective so the batter stands at, roughly, -2. There is a strong directionality. Inside pitches are more like to get by the catcher than outside. This could have to do with batter being in the way, making inside pitches harder to see, or could be the pitch location versus expectation of location issue I talked about above. Also catchers miss balls in the dirt more often then they miss high pitches. Finally we can see the wild pitch/passed ball rate on each pitch type. This is the rate of these occurrences per non-contacted pitch of each type. Again the results here are not very surprising. Fastballs have very small rate, while knuckleballs are off the charts. 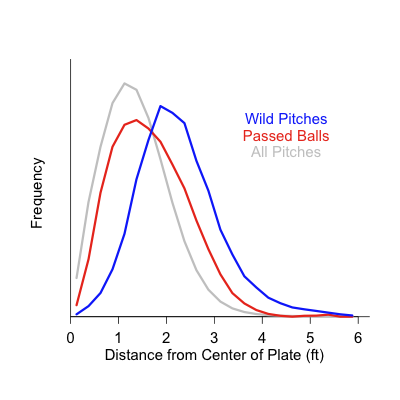 There is definitely an interaction here between pitch type and pitch location, fastballs are less likely to be far out of the zone than a curve or knuckleball. In addition it would be interesting to see how spin deflection and break of a pitch affect it. I will combine all of these in the next post into a larger model predict passed ball and wild pitch rates and then using that to evaluate catchers. Very nice idea; I was thinking of doing something similar but you beat me to it. Did you also control for the bases occupied? Obviously, no PB/WP can occur with the bases empty (except for dropped 3rd strikes), and runners on first will advance on more PB/WP than runners on second or runners on third. Also, the score might affect whether or not a runner advanced, since runners are much more cautious in a blowout and much more aggressive in a close game. How does the Pitch F/X data record a pitch in the dirt? 0 feet off the ground, regardless of how far in front of the plate it bounces? If we see 0 feet (vertical), can we always assume that the ball bounced in the dirt or can it be a ball that is caught cleanly an inch or even 6 inches above the ground? Obviously most WP are pitches thrown in the dirt (I assume), and almost no PB are pitches in the dirt. That is important. Also, a fastball in the dirt is extremely difficult to catch. A slider is somewhat difficult and a curve ball is not all that difficult unless it is way to the right and left. I would like to see all of that quantified. yeah I need to control for the base state. I have not done that yet, but will in my next post. The system has two ways of indicating. One is that it records a 'ball in the dirt.' The other way is more useful. Since the pitchf/x system estimates the equations of motion for the pitch you can see where the pitch hit the ground. For those pitches the vertical position (which is the position as the ball initally crosses the plate) is negative. I hope that the model I present in my next post quantifies the issues your raise. Dave: You mention that catchers have more trouble with inside pitches. While that could be the presence of the hitter, it might also be that catchers have more trouble with balls on the glove side of their body. What does this pattern look like for RHP vs. LHB? And with LHPs? Guy, great point. I need to check that out to see if it is the presence of the batter or the glove side of the catcher which is having an effect. Right now I just did RHP vs RHB.